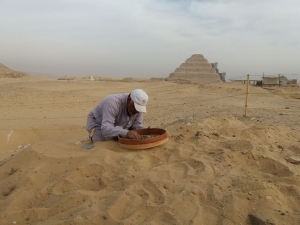 The 2019 Leiden-Turin excavations at Saqqara have started! Home/News/The 2019 Leiden-Turin excavations at Saqqara have started! A workman gently sifting the sand. This week the team members from the National Museum of Antiquities, Leiden, the Egyptian Museum in Turin and the Politecnico di Milano arrived in Saqqara. The mission’s excavation season starts Sunday 17 March and ends Wednesday 24 April. The first Digging Diary of 2019 is expected to go online on 22 March! Visit our website every week for the latest Digging Diary of the 2019 fieldwork season!